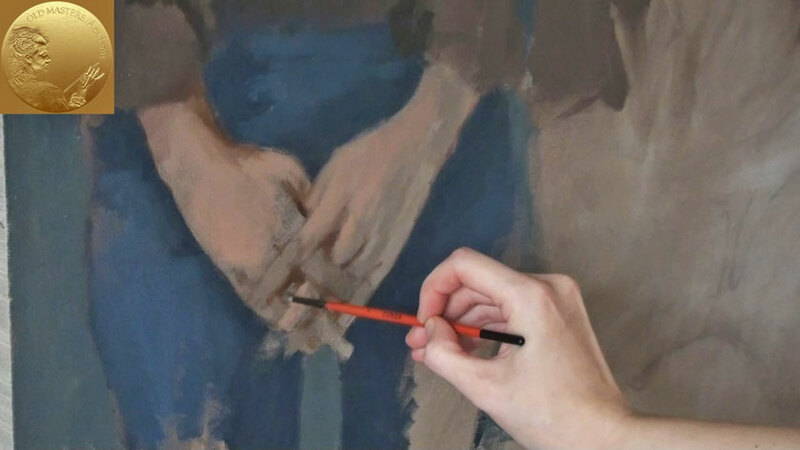 In this video we’ll show you how to paint the hands of the two figures. As in the case of the portraits we split the process of painting into two different methods. 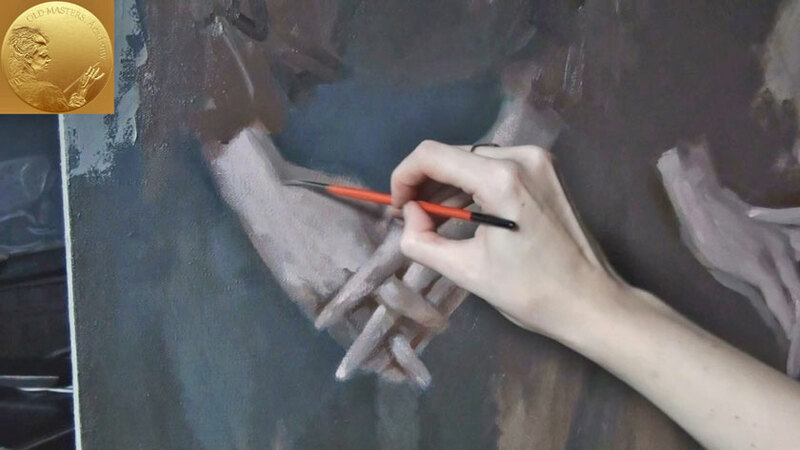 The first girl’s hands are painted in several sessions, while the second girl’s hands are painted alla-prima. Now we outline the first girl’s hands. The graphite pencil drawing helps us to do this. Using a small brush we outline the fingers and mark the shadows. Use a soft flash brush for this purpose. The brown paint can be diluted with Turpentine. Here I shall give you a piece of advice. Pay the same attention to the hands as to the whole portrait. The hands are as important as the face. 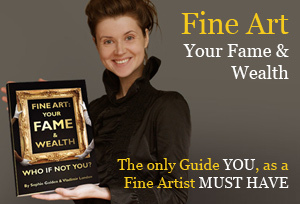 You can express the person’s individuality by portraying his or her hands. The beauty of the person also can be depicted through the hands, their position and the body language. 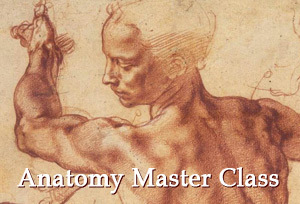 The method of painting the hands is the same as that of the face. First we place shadows. Use a lighter color for the task. It will be deepened a bit later. 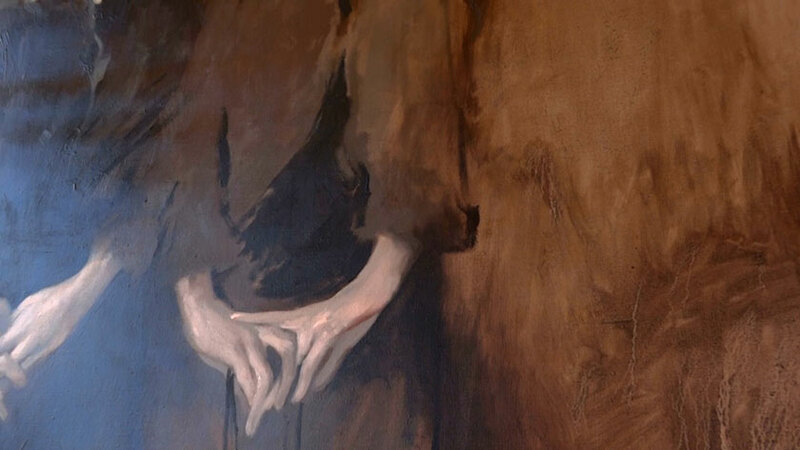 This is followed by the mid-tones of the hands, that can be a little darker. The mid-tones will be lightened in the process of painting by adding flesh highlights to the top of them. Vary the combinations of the cold and warm colors to paint the hands. Using the alla-prima we can easily mix the tones right on the canvas being ensured that there is no visible border between the tones. We use the loose expressionistic manner to paint the picture. The look of the pictures performed in this manner differs from the polished look of the Paris salon paintings. The characteristic brushstrokes are applied and this results in the freshness and lightness of the painting. From now on you can see the second stage of the hand painting. By this time the previous layer is dry and we can proceed to with the light areas of the hands. the Third one – implies applying of two tones – one tone is darker and the other one is lighter. The border between the tones is mixed on the canvas. 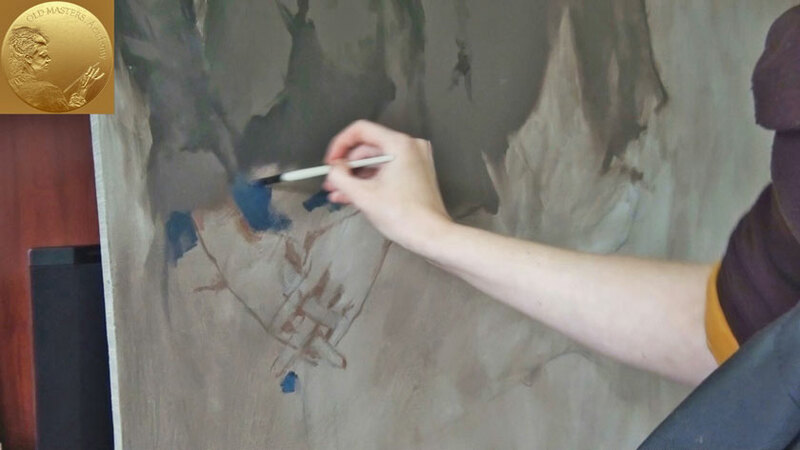 You can fill in the dark places between the fingers by applying the pre-mixed tones of the paint. Now we proceed to the second girl’s hands. 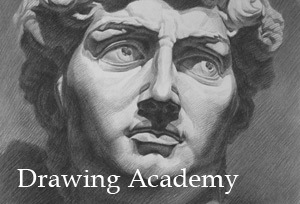 Using the pencil drawing as a guide, we start drawing with a small round brush. Dark paint is used for both: to outline and to indicate the shadows of the hands. Now we can visually separate the hands from the clothes. Here We’re use the brown tone. This brown tone is a middle-tone and the base for the girl’s dress. We also draw the outlines of the girl’s legs. This will help us in the future to paint the folds of the long dress. At this stage we fill in the background of the picture with tone. The brown mix is used for the purpose. This step helps us to decide which parts of the painting will be darker and which ones will remain lighter. Have a look at the way in which the canvas is covered with the paint. The semi-transparent effect is achieved by diluting the paint with Turpentine and using the mix for covering the canvas. The canvas is covered unevenly. 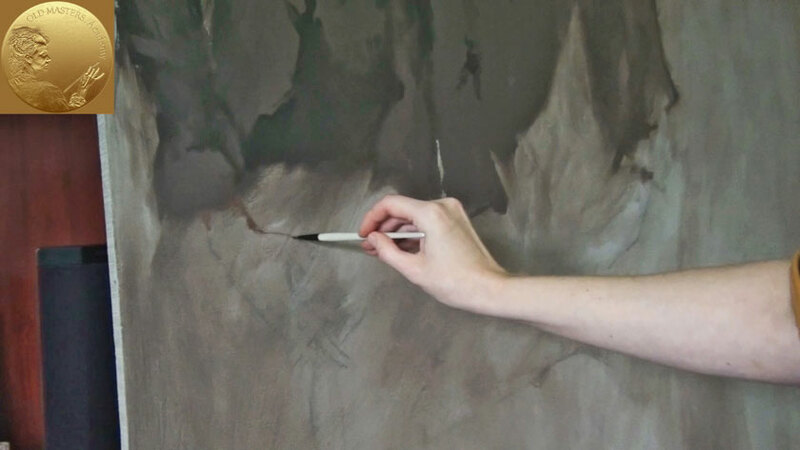 In some places the paint is diluted and flows over the canvas, in other areas the paint is less liquid and a thicker layer of the paint provides a more opaque layer. You should decide whether you would like to continue working on the background or leave it as it is. My chief aim was to achieve the combination of the properly painted places such as the heads and hands with the almost unfinished background and draperies. Due to this combination we achieve the fresh and airy effect of the painting. We are proceeding to the second girl’s hands. It’s easier to paint the hands in the tone desired for there is the brown background around the hands. We paint with the cold mid-tone, leaving the lightest areas of the hands untouched. The uncovered places of the hands are filled in with the warm flesh color. To begin with, the flesh paint is applied and the two neighbouring paints, the cold and warm, are mixed on the border. A dry brushed should be used. You can carry on with this method until you’re satisfied with the results. It’s time to apply some highlight to the top of mid-tones of the hands.